Dad's socks were starting to reek but it was the sweet smell of success from a landmark victory that enveloped Georgia Hall after her Women's British Open triumph at Royal Lytham and St Annes. 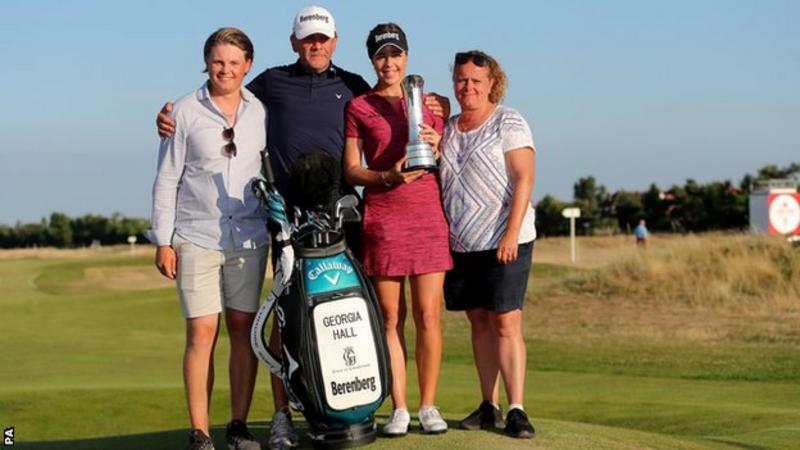 As her father, Wayne, proudly looked on, the 22-year-old from Bournemouth had emphatically put behind her a difficult start to her LPGA career in spectacular style. Her two-shot victory over Thailand's Pornanong Phatlum was a true triumph of temperament and skill. It was her first win at tour level and only the fifth for a British woman at a major championship. But dad and daughter had been quietly confident that it might happen on the famous Lancashire links. "It just felt right all week," Wayne Hall told BBC Sport. "We felt really, really confident, actually. 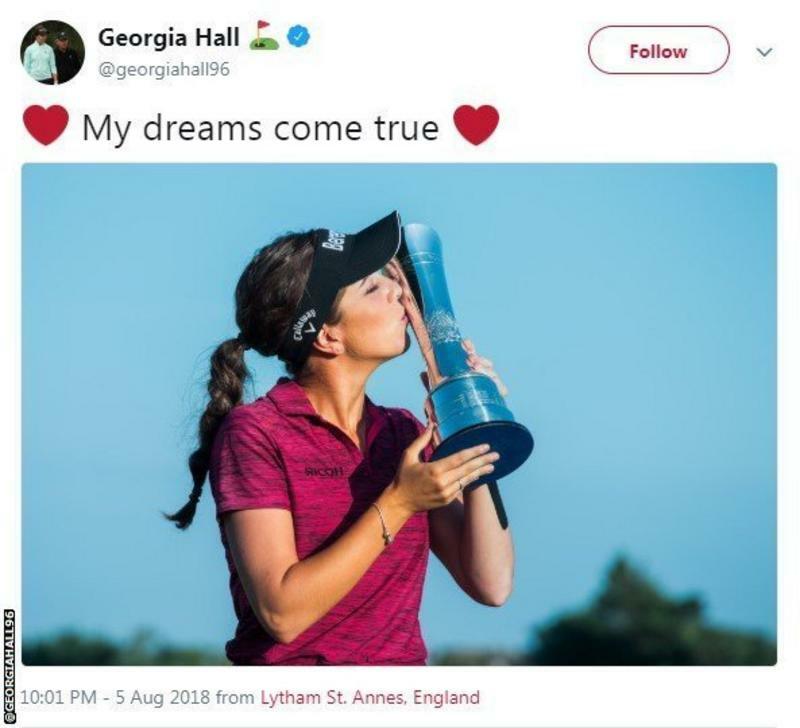 "We've been dreaming about this since she was seven years old, practising and knocking putts in for the British Open and it's actually happened. "This is the biggest tournament for her and for us and we really, really went for it after last year when we finished third. We thought we'd really go for this one and it has paid off brilliant, unbelievable." Georgia is somewhat superstitious. After her excellent opening-round 67, she told her father that he must not change his socks for the remainder of the tournament. But it was her instructions on keeping his feelings in check that were more telling. "I'm not allowed to show any emotion because if I show I'm happy that's not right," Hall senior revealed. "So I can't show any emotion at all, it's just to try and keep her level-headed really. Also, I wasn't allowed to change my socks, same socks all four days so they stink a bit now." This victory was some turnaround after an uncertain start to Hall's career in the United States. Off the back of her third-place finish at last year's Women's British Open and winning the 2017 Ladies European Tour Order of Merit, she embarked on a full-time schedule Stateside. Life away from home - she splits her time between Bournemouth and her boyfriend's place in Surrey - was difficult. At June's US Open she sought advice from former Ryder Cup player and BBC TV's Ken Brown who was there commentating for US television. "Georgia was struggling a bit in America, not so much about her game but just getting used to playing in America," Brown told me. "So she said: 'Will you come out and have a wander around and tell me what you can see?' It was mainly a bit of encouragement to say 'you've got the game' and that for all of us who go to play on the PGA Tour or the LPGA it is a struggle to start with. "You don't know the courses, you don't know the people and you have to stick in because you'll reap the benefits along the way. Little did I think six, eight weeks later that she was going to be the Women's British Open champion." Brown dined with Hall and her family during that US Open week, getting to know better the youngster who has always had immense potential. On debut last year she was the only European to feature in all five matches at the Solheim Cup. That performance showed her mentality for the big time and she revelled in performing in front of the huge Lytham galleries. Nevertheless, it was a long way removed from the days when she first picked up a club, hitting shots for chocolate bars as a seven-year-old. "She was a 36-handicap at nine and she joined Ferndown Golf Club," Wayne Hall said. "At 10 years old she got down to 10 handicap and then she set the course record of five-under 67 when she was 11 and that still stands now. "Then she was selected for the England squads and just improved from there to where she is now." And for the girl named in honour of Sir Nick Faldo's Masters win in 1996, having been born on the Friday of that victory in the Georgia town of Augusta, Hall is now at the pinnacle of women's British golf. "It's brilliant for ladies golf, brilliant for Georgia at 22," Brown commented. "Her first pro win and it will be a big stepping stone hopefully to get women's golf over here kicked on. "What a delightful girl and family as well - it's like a Cinderella story." Brown had tweeted Hall on the eve of the tournament to tell her how good her putting stroke was looking. It provided the final injection of confidence as she holed putt after putt to go bogey-free for the first 48 holes of the championship. "You could see she had a beautiful touch and her putting this week was as good as anyone I've ever seen," said Brown. Hall had also sought out the opinion of the men's Open champion at Lytham in 1996, Tom Lehman, with whom she played a pro-am event last month. "He texted me last night," Hall revealed on the evening of her victory. "And just said: 'Go, Georgia. Hit fairways and greens and make your share of putts, I'm pulling for you.'" Lytham's latest champion followed Lehman's edict to the letter to give women's golf in Britain a huge fillip. It's also a big boost for this week's inaugural European Championships event at Gleneagles where she partners Laura Davies. Furthermore, dad can finally stick his socks in the washing machine. British sprinting - what is going so right?